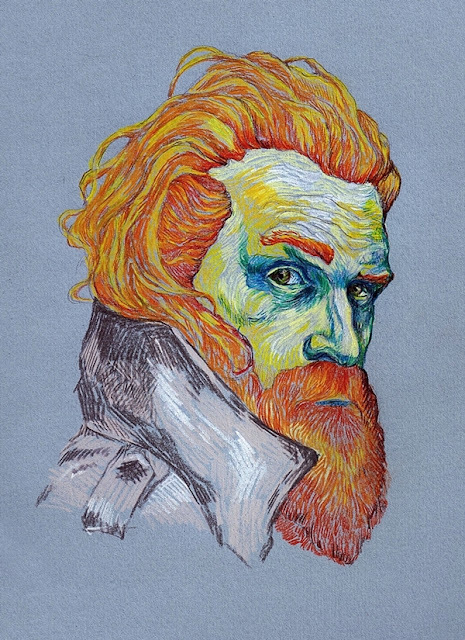 Everything Is Art: Painting of the Day: "Kristofer Hivju"
A beautiful contrast of the warm reds, oranges, and yellows against the cool blues and greens. Add a neutral background to complement the colours and the piercing gaze of the sitter easily captivates the viewer. Is he eyeing you in suspicion? Or is he just a mysterious stranger giving you a passing glance? I like that the artist left out all unimportant details and instead chose to make the eyes the focus of the piece, but wished that the beard had a little more shadow to give it more form. However, this piece truly shows the versitility of the humble coloured pencil, and you should totally check out Daria Zaitseva's "Sailor" as it has beautiful line work.